Karachi is not a rainy city and any rain received by this city is always welcomed by its citizens, as it brings down temperature and cleans the atmosphere. Some monsoons in the city have been rather dry but others quite wet, and 2009 was one of those monsoons. After a hot day, around 2 30 pm, dark clouds started to come towards the city from E/NE, giving the hopes of a heavy downpour. However, as the cool breeze started to blow, things did become pleasant but not a single drop fell across the city and the clouds gradually cleared by late evening. Karachiites endured another hot and humid day while the mugginess enhanced with each passing hour. Around 4 pm, thick black clouds accompanied by rumbles of thunder covered the city sky, giving the promise of a heavy shower, but again, the heavens failed to pour properly. Only light rain was received by some city parts. Gulshan-e-Hadeed got 4 mm, Airport, North Karachi, North Nazimabad and Nazimabad received 2 mm each while 1 mm was recorded at Faisal Base, Landhi and Saddar. As midnight came and day changed to 18 July, the skies appeared to be enveloped by thick, black clouds while occasional flashes of lightning and cool breeze made the night very pleasant. Parts of the city in SE and E (DHA, Jauhar, Landhi and adjacent areas) received some rain around 3 am. As the night gave way to a heavily overcast morning, one could sense that Karachi was about to be blessed by the eagerly awaited first monsoon downpour. The wish of the city finally came true as around 9 30 am, heavy rain accompanied by strong gusty winds and lightning and thunder lashed the metropolis. Moderate to heavy rain continued in the city throughout the day, ending around 7 pm. 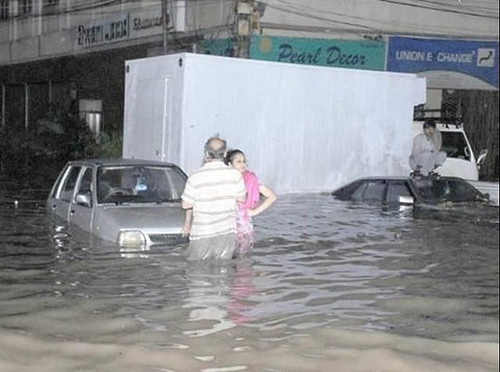 Those who thought it was the end were gravely mistaken as Karachi was yet to experience the real taste of monsoon! Starting between 9 30 and 10 pm in different parts of the city, this time the rain came down hard, very hard. I had never seen such a torrential downpour ever in my life. Extremely heavy rain, accompanied by winds having velocity of 60 to 65 km/h continued to pound the city for the next one-and-a-half hours, subsiding at 11 30 pm. Low-lying areas of the city turned into virtual swimming pools. The main roads of the city as well as many nullahs passing through the city turned into raging torrents, while the whole city sank into darkness as the grid stations tripped across the city in quick succession. Landhi 177 mm (including 77 mm from morning till evening). You can see well that almost all areas of city received above 100 mm rain in just one-and-a-half hours that night, with the rain received by the city between morning and evening forming only a small proportion of the 24-hour downpour. This was the second heaviest 24-hour downpour in July (205 mm max) with the heaviest being 207 mm, recorded on 1 July 1977. Many parts of city once again received heavy rain in the afternoon between 2 pm and 4 pm, specially N, NW and central parts. 35 mm rain was recorded at Paposh, Nazimabad (information courtesy: Waseem Ahmed), while 10 mm was recorded in Saddar, 8 mm at Mauripur and 5 mm at Airport.